Faema E92 ELITE, 3 groups, YEAR 2004.STOPPED ONLY RECENTLY. AVAILABLE EX WORK NORTHERN ITALY. PAYMENT IN ADVANCE BY BANK TRANFER IS REQUIRED TO "BOOK THE EXACT MODEL YOU SEE IN THE PICTURES". 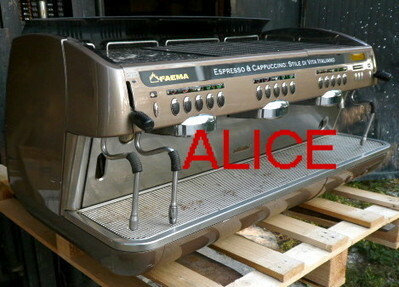 SEE A LOT OF VERY DETAILED PICTURES IN OUR WEB SITE espressousato.com.